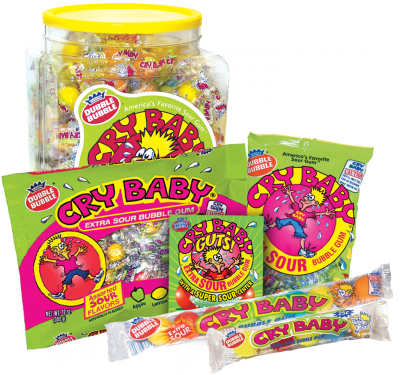 Mouth-puckering Cry Baby Extra Sour Bubble Gum provides long-lasting bubble gum chewing fun. Available in six super-sour flavors—Lemon, Cherry, Apple, Berry, Orange, and Watermelon—they’re available loosely packed in 5- and 9-ball sleeves; and individually wrapped in multi-count bags, jars, and tubs. 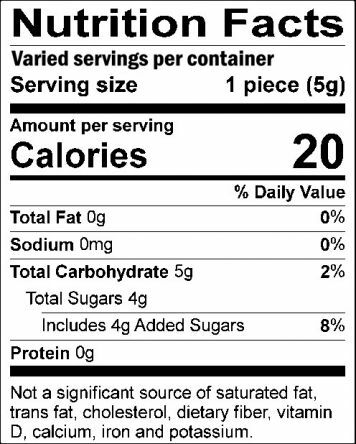 INGREDIENTS: Sugar, Dextrose, Corn Syrup, Gum Base, Citric Acid, Tapioca Dextrin, Artificial Flavors, Artificial Colors (FD&C Red 40, Blue 1, Yellow 5, Yellow 6), Corn Starch, BHT (to maintain freshness). Chewing multiple pieces within a short time period may cause a temporary irritation to sensitive tongues and mouths.